Charles Butterworth was an early 20th century English amateur astronomer, and the first to accumulate 100,000 variable star observations. The British Astronomical Association's Variable Star Section has presented the Charles Butterworth Award twice, to individuals who have made an outstanding contribution to variable star astronomy. The first award was given to Arne Henden, Director of the AAVSO. 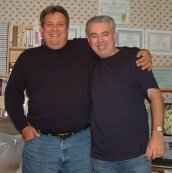 I had the good fortune to be present at the joint meeting of the BAAVSS and the AAVSO in Cambridge, England in 2008, when my good friend, Gary Poyner was presented the second Charles Butterworth Award for surpassing the 200,000 variable star observation mark. 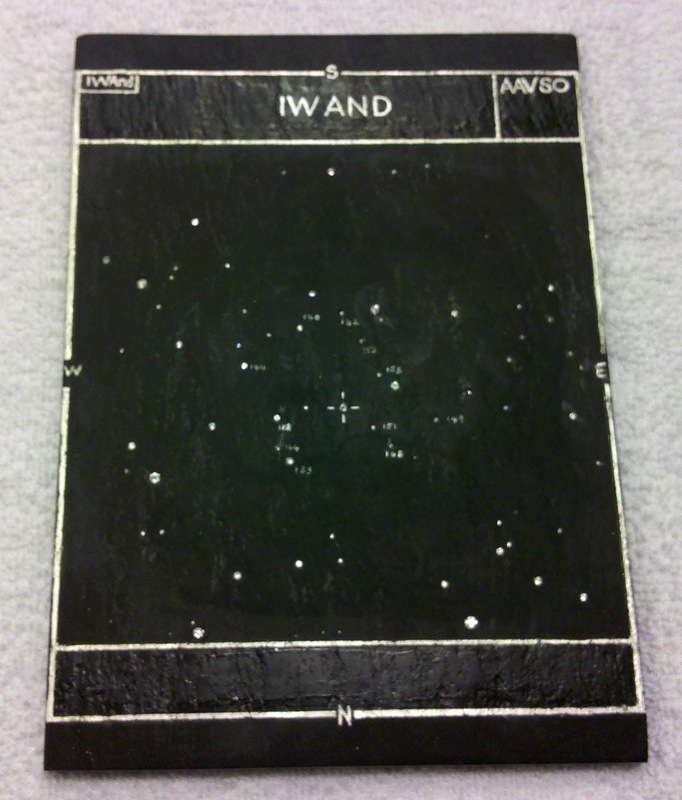 I was caught completely off guard when BAA representative, John Toone, after presenting a plaque and well wishes to the AAVSO from the BAAVSS, began speaking about the improvement in charts and sequences at the AAVSO Centennial Banquet. Before I realized where this was going he had announced that the BAAVSS had chosen to present me with the third Charles Butterworth Award. The citation on the back reads, "This, the third Charles Butterworth Award, was presented to Mike Simonsen on 8th October 2011 by the Variable Star Section of the British Astronomical Association, in recognition of his outstanding contribution to the development of charts and sequences." 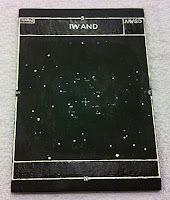 It is a beautiful hand etched and painted slate plaque whose face is a rendering of an AAVSO f scale chart of my favorite star, IW Andromedae, complete with comparison star labels. The stars are inlaid semi-precious stones that twinkle under light, and they are in precise agreement with both the position and brightness of the stars in that part of the sky. I was left speechless at the sight of it, both for its beauty and the sentiment behind it from the people it came from. I shall treasure it always. It is the slickest award I have ever laid eyes on. The imagination, insight, care, and presentation of this award and its form boggle my mind. I'll have to make a point tomorrow to see Arne's. And since Gary never leaves his beloved England, I'll just have to go over and see his sometime! I was in tears when you got it, Mike, and no, I knew nothing about it. I'd admit it now, if I did. It's presentation made for an utterly magnificent evening! Many congratulations! An outstanding achievement, and what a great idea for an award trophy. Truly something to be always treasured.